What Is the Cost of Living in Tennessee? According to Trulia, the Tennessee county with the lowest average listing price is Lake County, where the average home price is $69,857. The county with the highest average listing price is Williamson County, where homes list for an average of $548,612. Zillow puts the average Tennessee home value at $130,700. Prices in the Volunteer State are up 4.2% in the last year. Still not sure whether to rent or buy? Rent in Tennessee is generally below the U.S. average. Studio apartments in Tennessee rent for an average of $1,096, according to MyApartmentMap. That’s $22 above the U.S. average. From there, Tennessee rents dip below the U.S. average. A one-bedroom apartment in Tennessee has an average rent of $857. That’s $151 below the national average. If you want to rent a two-bedroom apartment in Tennessee, you can expect to pay around the average of $995 per month, $244 below the U.S. average. Need three bedrooms? In Tennessee, you’ll pay around $1,182, $364 under the nationwide average. According to the U.S. Energy Information Administration, the average monthly utility bill in Tennessee is $132.76. That’s 16% above the U.S. average monthly utility bill of $114.09. What about utility costs in Nashville? According to Numbeo, the average monthly utility bill in Nashville, Tennessee is $127.68. In Knoxville, TN, the average monthly utility bill is a pricier $137.69. 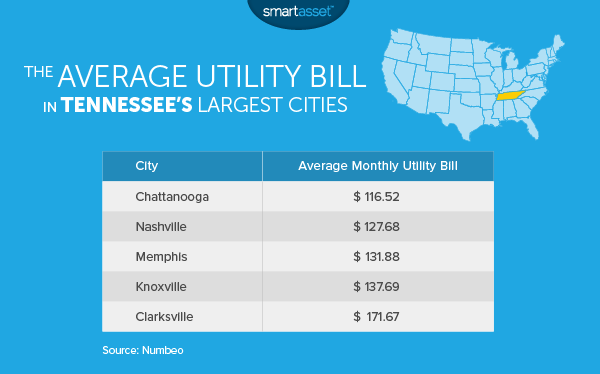 Check out the chart below to see how utility costs compare in Tennessee’s 5 largest cities. Compared to an index of 100, grocery prices in Tennessee earned a score of 94.4. That means they’re a little cheaper than the U.S. average. Numbeo’s minimum recommended monthly spend on food in Nashville is $268.61. In Knoxville, the recommended minimum is much higher, at $433.29. How does healthcare in Tennessee stack up? In the Volunteer State, 83% of adults between the ages of 19 and 64 have health insurance. That’s just a hair under the national average of 84%, according to the Commonwealth Fund. However, 16% of adults went without health care because of cost. That’s 2% over the U.S. average. According to the Kaiser Family Foundation, the second-lowest-cost Silver plan on Tennessee’s health insurance Marketplace has an average cost of $281 for 2016 coverage. That’s up 38.4% from the previous year. Want to pursue higher education in Tennessee, for yourself or your child? The highly ranked Vanderbilt University estimates its tuition and fees to total $63,532 for the 2015-2016 academic year. That’s not including the $718 First Year Experience Fee. If you fear student loans, there are less expensive options in the Volunteer State. For example, there’s the University of Tennessee Knoxville, where in-state tuition is $6,218 per semester, compared to $15,428 per semester for out-of-state students. Tennessee’s state tax system has been called the most regressive in the nation. A study by economists at the Federal Reserve found that Tennessee’s tax regime offsets 32.7% of the progressiveness of the federal tax code. In other words, the federal tax system aims to get wealthier folks paying a higher percentage of their income in taxes. But when you add in the Tennessee state taxes, the inequality-compressing effect of the federal tax system is lessened by 32.7%. There is no state income tax in Tennessee but the state imposes a 6% tax on dividend and interest income. 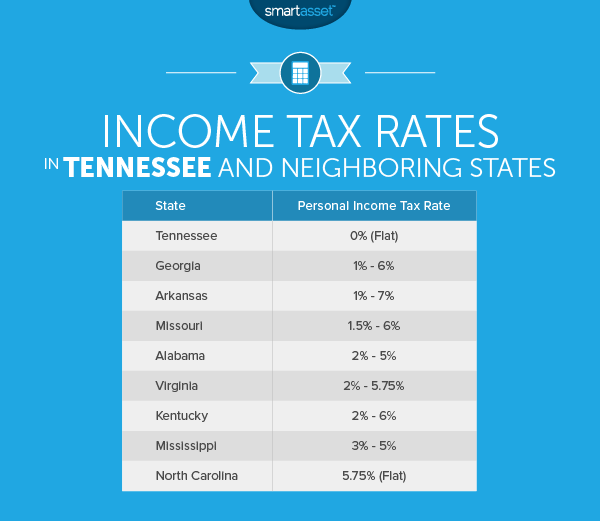 Check out the chart above to see how Tennessee’s income taxes compare to the taxes in neighboring states. Tennessee’s sales tax ranges from 8.5% to 9.75%, depending on the county in which you are shopping. The base state sales tax rate is 7%, and counties impose supplementary rates that range from 1.5% to 2.75%. Tennessee has plenty of attractions to keep tourists and residents happy. For one thing, there’s Graceland, Elvis Presley’s home. A ticket to Graceland will cost you $38.75 for the cheapest option. Tennessee also has options for nature-lovers. Admission to Great Smoky Mountains National Park is free. If you want to camp in the park, you’ll pay between $14 and $23 per night. Admission to the National Civil Rights Museum in Memphis is $15 for adults. The Hunter Museum in Chattanooga is also $15. The Frist Center for Visual Arts is a slightly cheaper option, at $12 for adults. 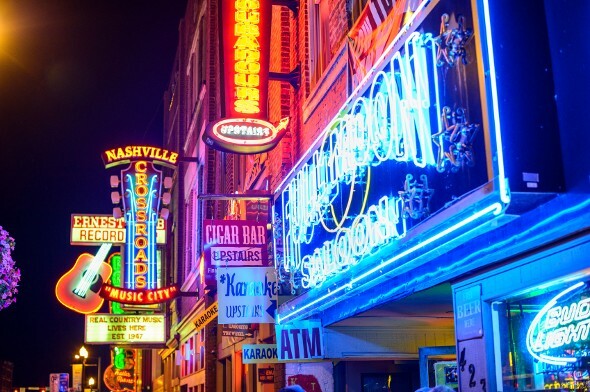 If you’re preparing to move to Nashville or elsewhere in the Volunteer State, it can be helpful to know how the change will affect your budget so you can plan accordingly. If you’ll be switching jobs, your paycheck may end up looking quite different than it does now. Try using our paycheck calculator to estimate what your take-home pay will be. A financial advisor can help you navigate big life changes like a cross-country move, or just help you to meet your financial goals in general. A matching tool like SmartAsset’s can help you find a professional to work with to meet your needs. First you answer a series of questions about your situation and your goals. Then the program matches you with up to three financial advisors who meet your needs. You can then read their profiles to learn more about them, interview them on the phone or in person and choose who to work with in the future. This allows you to find a good fit while doing much of the hard work for you.